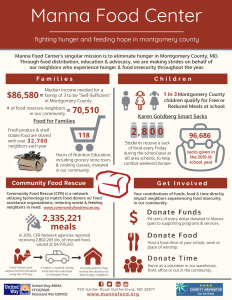 Manna Food Center is at the center of ending hunger in Montgomery County. Community is at the heart of all we do – and our core programs deliver the nutritious food, life skills and connections that enable them to tap into their own capacities and thrive. We champion the needs of those experiencing hunger temporarily and we care for families with children, the elderly, and those coping with crisis. Manna’s programs are founded on a deep yet simple focus: we value not just the number of transactions but the quality of our relationships, with our food recipients, our volunteers, and our donors. We listen to our clients and peers to adapt our ideas and implement accordingly. After three decades of reliable service, Manna evolves daily to better address the causes and symptoms of chronic hunger in our community. We have a prosperity mindset and knowledge that our great county can be a place where diverse neighbors come together to end hunger. Hunger is a complex and insidious issue, but Manna’s programs have unparalleled reach and impact. Of course, we don’t do it alone – our programs rely upon Manna’s well-established network of volunteers, political, faith-based and community leaders, elementary schools and local and commercial food providers. Pillar 1: Reduce hunger and improve access to nutritious food for County residents who experience food insecurity. Pillar 2: Strengthen community food skills and knowledge to encourage and enable healthy eating. Pillar 3: Connect County neighbors to service providers and to each other. Ending hunger – it’s what we do. Reaching as many as 3,800 families a month while sharing 4 million pounds a food a year, Manna will not be satisfied until we make our vision of a hunger-free community a reality.